"Long ago, I became more interested in the real world than in make-believe." Bill Robinson (Bojangles Robinson) and they appeared in four films together. 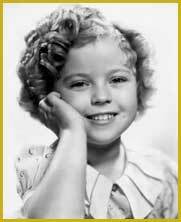 Movie fans loved her – her bouncy curls (56 of them), her upbeat and cheerful personality. They would buy anything that had her likeness on them – dolls, phonograph records, mugs, clothing, hats, dresses or anything that had her likeness on it. She made millions for the studios and vendors. By the time she was 11 years old her star was waning. As an adult, she worked for the State Department, in 1969 was named a delegate to the United Nations and in the 1970s she was appointed Ambassador to Ghana and then Czechoslovakia. She was married first to John Agar (five years, one child, divorced) and then to Charles Black from1950 to his death in 2005 – 2 children. Shirley died February 10, 2014 in Woodside, California from chronic obstructive pulmonary disease. 1935 Won – Juvenile Award: In grateful recognition of her outstanding contribution to screen entertainment during the year 1934.